Fomula T is a homage to classic Americana. We named it after the iconic Ford Model T. The goal was to create the best shaving soap possible. We wanted it to be slick, super easy to lather, have decent cushion, and give you a great post shave feel. Using tallow and shea butter, and concentrating the formula through a long cure time, we think this is the best shave soap for the money! Matterhorn – This fragrance was designed to take you to the Swiss Alps and the sparkling streams of water of the spring snow melt. Crisp and fresh, this is a fantastic fragrance. Inspired by Creed Silver Mountain Water. Formula T is extremely dense. Our long lasting concentrated soap will last you from 150 up to 350 shaves. 135 grams, 4.7 ounces by weight. The secret is the long curing process. We let the soap cure for as long as it takes to remove any excess water, so all you’re buying is soap; not water. 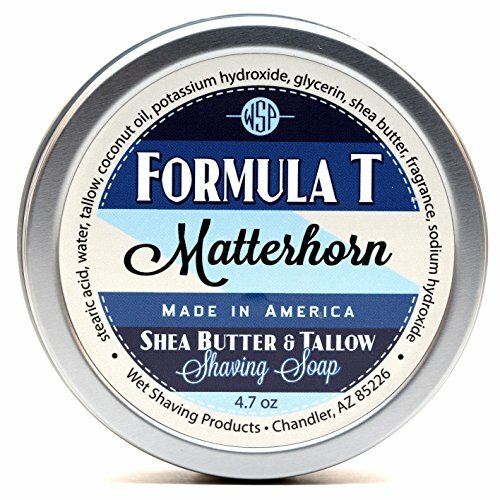 This entry was posted in Wet Shave and tagged Butter, Formula, Made, Matterhorn, Shaving, Shea, Soap, Tallow.